The Baynhams: Advent Day 12 - Better late than never! Sian is home from her sleepover. 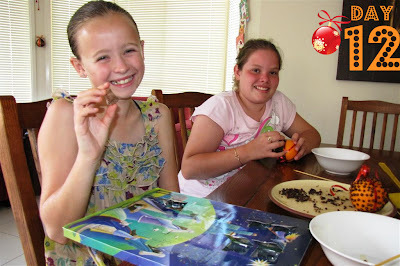 She brought her friend Jessica home with her and they got stuck into making some clove oranges to give the house (and their hands) that Christmassy smell! So here she is opening window 12 on the 13th. I can remember making those clove oranges years ago. Love the scent!